Be the Super Bowl Appetizer Queen! Are you headed to a Super Bowl party this weekend? Why not be the Queen of the appetizers? I could easily make a meal out of dips and spreads; in fact, I think there should just be a restaurant that serves only appetizers. 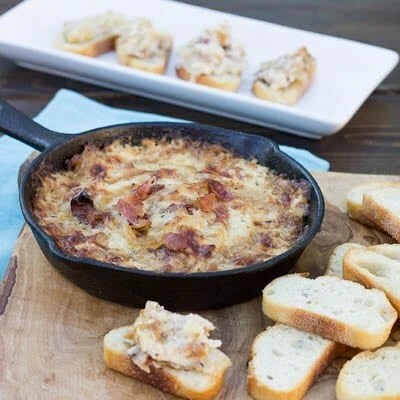 Over the holidays, I made this Hot Caramelized Onion, Bacon & Gruyere cheese dip, and it was smack your face delicious! Cook bacon in a large nonstick skillet. Remove to a paper towel lined plate to cool. Crumble. Add onions, sugar, and salt to bacon fat in the skillet and cook over medium-high heat for about 5 minutes. Reduce heat to medium and cook, stirring often, until onions turn a deep golden brown color. This can take as long as 20 minutes. If onions start to burn, turn heat down to medium-low. Add sherry and cook 1 minute. Stir in thyme and tabasco. Remove from heat. Mix together sour cream and mayo in a medium bowl. Add crumbled bacon, cheese, onion mixture, and black pepper. Mix together well and transfer to a 2-cup baking dish. Bake 20 minutes, or until bubbly and golden brown on top. I Want More RECESS In My Life! We Would Love if You LIKE Us!